Planning a party, staff meeting, or a simple get-together? Not sure how you’re going to feed all those people? 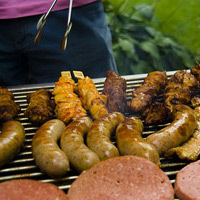 Let us help serve up your guests with a commercial-duty barbecue. If you’re shy on seating arrangements, come pick up some tables and chairs. Remember, you can always phone in a reservation well before your event – it’s never too early to plan ahead! An essential part of your backyard party. Need to feed all of your friends at once? This is the grill for you! The propane-powered, 150,000 BTUs are the industry’s best BTU output per square inch of cook surface. Total cooking surface: 1260 square-inches. Features include: brushed stainless steel construction; stainless steel burners; stainless steel cooking grids (for easy cleaning); stainless steel flavour plates (provides even heat while reducing flare-ups); crossover ignition system (ensures reliable lighting every time); 10-inch semi-pneumatic wheels and locking casters for easy set-up anywhere; heavy-duty removable roll cover with thermometer and “Cool Handle”. Now this is a cooler! With it’s generous 156-litre capacity, this monster can hold 280 cans, and keep them cold for up to 7 days. Equipped with two folding handles, an easy-access opening, drain spout, and even four built-in drink holders. Great for camping trips or backyard parties! Chairs are padded for extra comfort. This might not be our most exciting rental, but it’s surely one of the most practical. Folding, padded chairs that stack for easy transport. Folding, 72” × 30” poly tables. Our 6-foot (72” × 30”) folding tables are constructed of high-density polyethylene and are stronger, lighter and more durable than wood. For indoor or outdoor use, built for the rigors of demanding commercial use. Stain-resistant and easy to clean.